We hit the 1 week mark today. Casey has been having some pain issues again over the past 24 hours. We have been trying to get her as comfortable as possible- without much luck so far. The doctors have a few ideas to try and isolate the source of the pain. It could be so many things. We won’t have more details on that right away, it may take the rest of the day/night. It could be related to feeding through the new J tube, it could be site pain from the closed G tube, it could be from the air pressure with the additional treatments, etc. We went back to 15cc/hr instead of 30 on her food and it may be helping. If the pain is from us going up too fast on the rate we can back off them go up again much slower. We’ll see how she does on the lower rate over night. 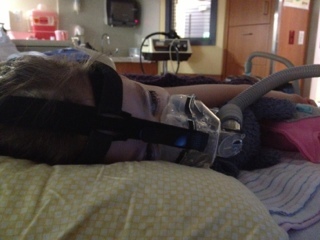 Casey is still doing bipap and lots of respiratory treatments. Watching My Little Ponies helps pass the time. She got her wheelchair back from the shop today. Now that she has her chair we will try to get her up out of bed some tomorrow. 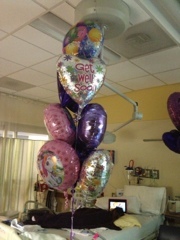 While watching ponies she got a surprise bouquet of pony balloons from her friends at Neotech. Thank you Neotech.